The Airflow 1 Clearomizer Tank by 180 Smoke offers a high quality upgraded design with a variable airflow function to control how tight, or lose, the draw of vapor in your device is. It is equipped with an improved bottom dual coil that produces greater vapor and top notch flavor. It has a capacity of 1.8ml, or approx. 1.5 packs of cigarettes. Due to popular demand 180 Smoke now offers the Airflow 1 Tank, the improved clearomizer with variable airflow control at the base, that comes with our Cloud Maker Plus Kit. The variable airflow allows you to control how tight or lose of a draw of vapor you get from your device. By turning the rotating base of the tank, you reveal from 1 to 5 airflow holes, basically going from the feeling of a tightly packed cigarette, to more of a hookah experience with the airflow fully open. The tank has a capacity of 1.8ml, equivalent to approximately 1.5 packs of cigarettes for most users, and is made of high quality pyrex glass, protected by a food grade stainless steel casing, with a food grade stainless steel base and removable drip tip. It is available in four different colours: Black, Steel, Blue, and Red. The Airflow 1 clearomizer tank uses high quality dual bottom coil at 1.8ohm, that produces greater vapor and top notch flavor! It is also compatible with Kanger Dual Coils that can easily be found everywhere. Replacement coils for the Airflow 1 are available here. 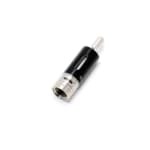 The coil, also called atomizer, needs to be replaced regularly, as required, when a burnt flavor or repeated leaking happens, usually after using approximately 40ml of liquid in the tank. The video below will show you how to change the coil and fill your Airflow 1, same as any tank with bottom coil technology. Variable Airflow control at the base with a rotating ring allowing for 5 different settings. Durable pyrex glass tank, with high quality food grade stainless steel body, base, and removable drip tip. 1.8 ml tank capacity of e-liquid, worth approximately 1.5 packs of cigarettes for most users. Improved Dual Bottom Coil at 1.8ohm, produces a greater amount of vapor and top notch flavor. Compatible with Kanger dual coils. Comes in four colours : Black, Stainless Steel, Blue, and Red. This is pretty great it has airflow as good as tanks that cost nearly twice as much. Really, really nice. I needed a new clearomizer after my old one broke and the staff recommended this one. I adore it so much, it tastes great and I get even more vapor than my old tank because of the airflow thingy.